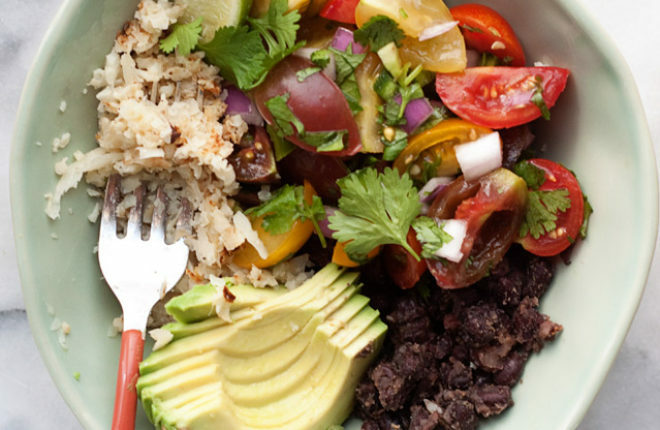 A base of cauliflower rice and seasoned black beans topped generously with cherry tomato pico de gallo and creamy avocado. Love this easy, healthy dinner! I know, I know. Spaghetti squash doesn’t really taste like actual spaghetti. And cauliflower rice doesn’t really taste like actual rice. But, seriously, both can make excellent, uber-healthy stand-ins for the real things. It’s totally true. In this case, I’ve swapped out the actual rice in your typical burrito bowl with cauliflower rice. Let’s see if anybody notices! Sorry, sorry, I went into advertisement mode. The truth is, people will no doubt notice – but they also likely won’t care. Because it’s delicious! 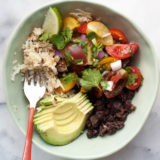 These Cauliflower Rice Black Bean Burrito Bowls start out with a base of cauliflower rice – which is basically just grated raw cauliflower, sauteed until tender (I like mine to get a bit golden). 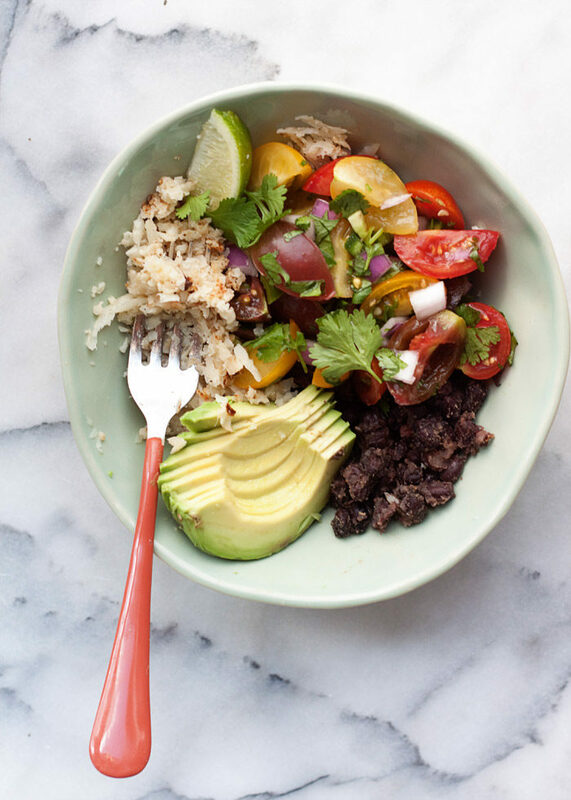 Add to that a scoopful of nicely seasoned black beans, some cherry tomato pico de gallo, and a few creamy slices of avocado. Done and done. This easy dinner (or lunch) recipe is super healthy, with tons of veggie goodness – but it’s super tasty too. Especially this time of year when you can pull the tomatoes right off the vine. And, theoretically, the cauliflower, if I could ever get any to grow in the garden. (I seem to have an errant broccolini sprouting up, so I guess I’m getting closer). By the way, I tested these bad boys on not one but two staunch carnivores, and they loved these healthy vegan burrito bowls. For real. (Though I have added a quick and easy meat option just in case). Easy, healthy dinner, you say? Check and check. Make the pico de gallo. 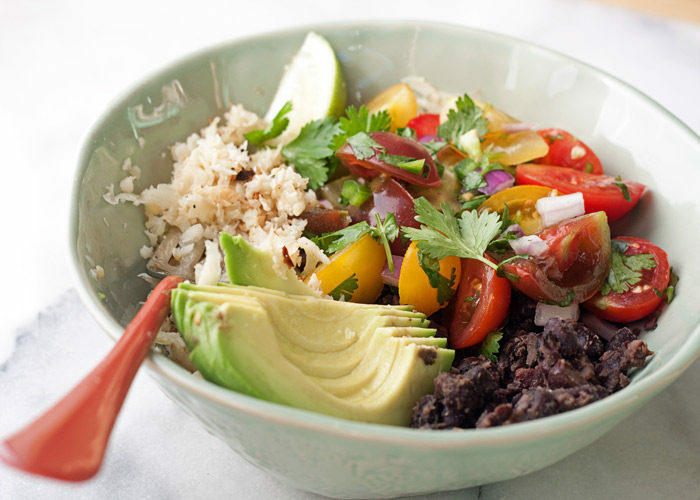 In a medium bowl, stir together all of the pico de gallo ingredients. Taste and add additional salt and pepper if desired. Set aside. 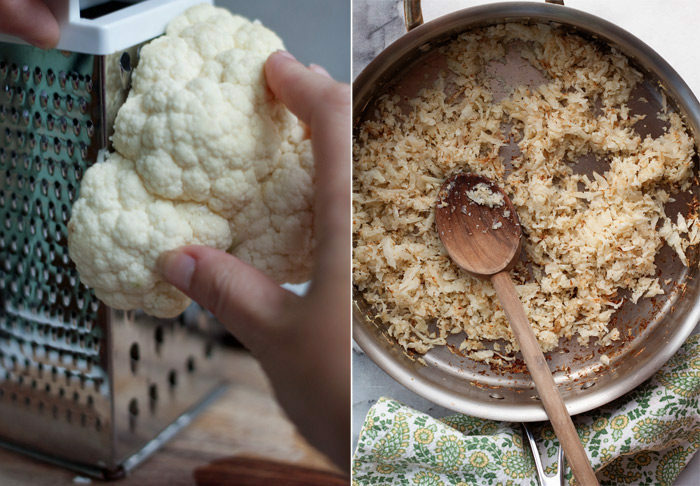 Saute the cauliflower rice. Set a large saute pan over medium heat. When hot, add the olive oil. Add the grated cauliflower along with a pinch of salt and pepper. Cook, stirring frequently, until tender, about 3 minutes. I like to give it an extra minute or two until it gets a bit toasty and golden. Set aside. Cook the beans. In a medium saute pan over medium heat, add the oil. Add the garlic cloves and let cook on each side for about 30 seconds. Mash with a fork. Add the drained beans, cumin, and salt and pepper and cook, stirring, until the beans are warmed through. Mash a few with the fork if you like, and if they start to look a little dry, stir in a bit of water if you’d like. 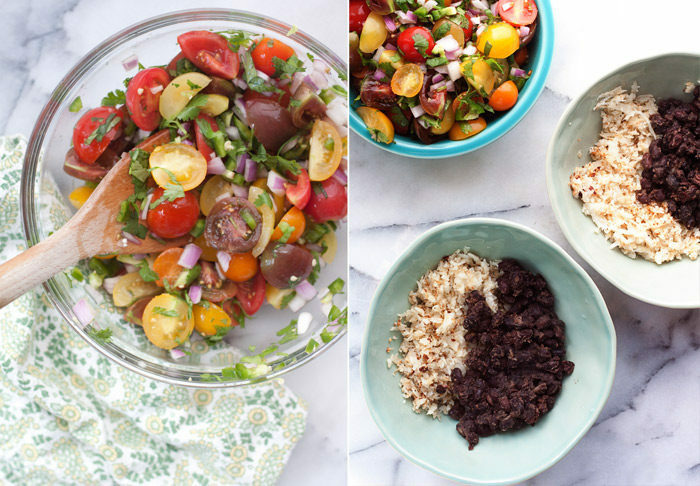 Assemble the burrito bowls. Set out two bowls and divide the cauliflower rice between the two. Layer in the beans and top with a generous scoop of pico de gallo. Top with avocado, a lime wedge for squeezing over the top if desired, and a few leaves of cilantro. Top one or both bowls with cooked, shredded chicken. Oh boy! I love cauliflower and what I like about this is that it is absolutely “opened” for meat version. Very creative and flexible ! i love your recipes and am trying to work many of them into my meal plan – do you have calorie counts?